Iranian musicians Negar and Ashkan look for band members to play at a London concert - and the visas that allow them to leave Tehran to do so. A documentary about Kurds, middle-east war and "Kurdistan", a nation with about 45m population and still without a country. With their mother long dead, twelve-year old Ayoub becomes the head of the family over his four brothers and sisters. Taking up the dangerous smuggling runs of his father, Ayoub is put in an even more difficult situation when he learns that his youngest brother, the severely handicapped Madi is getting steadily worse and will need an operation to live any longer than the next few months. With the dangers involved, Ayoub sets out to make the journey and the money to get Mani the operation he needs. 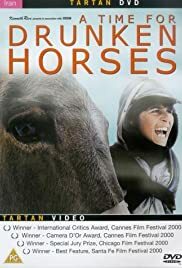 I had never heard of this film before I watched it, nor had I heard anything about it  I just was interested to see an Iranian film (my first I think). Despite having now read the many comments on this site about the film, I must confess that I was not as taken by it as everyone else seems to have been. What it does well is to present us with quite a convincing view of the general hardships and lifestyles of those living in this area and, as such it is pretty interesting. However when you take a look at the plot, it doesn't actually fit with the film's aim of realism. Firstly not a great deal happens and the film is not as consistently involving as it really should have been  even as a documentary style film it has several points where it drags quite heavily. The actual subject of the film rather undermines the reality of the situation, even if it is used to emotionally involve the audience easier than a straight documentary may have done. What I mean by this is the plot device of Madi  in the Western world I can accept a story where others will really put themselves out for others fianically; however in this situation I found it to be unconvincing that Ayoub would risk the immediate future of the rest of his family for the sake of Madi who, lets be honest, was never going to live for very long even with the operation. If he was my brother I would do anything, but I didn't buy that they would be able to spend the money knowing that they would save Madi but maybe condemn the whole lot of them to starvation etc. It did make me more emotionally involved in the film but I have to wonder how much more involving it would have been if Madi's suffering would have been just yet another unchangeable part of this family's situation. The cast are pretty good considering the fact that none of them are actors and, in contrast to many Western movies, it is the children who are vastly superior to the adults. While many of the grownups seem uncomfortable in front of the camera and only act natural when in crowds, the children are best in the smaller moments. In particular Ahmadi's Ayoub is a very sympathetic character and is a good way to get into the story; likewise it is very difficult not to get emotionally involved when you see Ekhtiar-dini crying and crying over just one of his daily injections. However out of the rest of the cast there isn't enough material to go around and too few of the ensemble cast have much to do but hang around and look deprived! The direction is great and manages to blend the beauty of the scenery with the desolation of the lives to good effect  that sounds a bit pompous but I can't describe it any other way! This is a slow film that doesn't have the plot that it deserved and it may alienate the casual viewer but it is still worth the effort. The acting of the main children is very convincing, the direction captures the beauty of Iran as well as the sheer grind of the characters' lives and the film is mostly interesting. Only weaknesses in plotting stop it from being better.